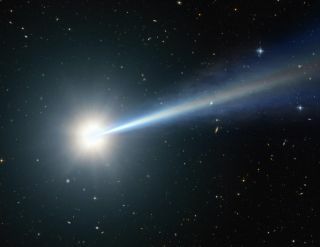 An artist's impression of a quasar, a galaxy the bright center of a galaxy that radiates more light than all the stars in the galaxy combined. Scientists recently used light from quasars to hunt for a theoretical characteristic of the universe called quantum foam. As light travels to Earth from distant galaxies, its road through the cosmos may not be smooth. A theoretical characteristic of the universe called "quantum foam" could make space and time rough and chaotic at very small scales. Some models suggest that scientists could see the effect of this foam in a large group of photons that have traveled a very long distance. The universe we perceive is made of three dimensions of space and another dimension of time, which together make up a single fabric that Albert Einstein dubbed "space-time." For things like people, planets, stars and anything larger than an atom, space-time is smooth. Large objects move through it like a car driving over a freshly paved road. "One way to think of space-time foam is if you are flying over the ocean in [an] airplane, it looks completely smooth," said Eric Perlman, professor of physics and space sciences at the Florida Institute of Technology and lead author on the new research, in a statement from the Chandra X-ray Center. "However, if you get low enough you see the waves, and closer still, foam, with tiny bubbles that are constantly fluctuating." A boat traveling over the surface of the ocean would not experience any measurable affect from the foam, but very small objects might. Perlman and his colleagues' new research was an attempt to observe the effects of quantum foam on particles of light. The bumps and bubbles created by quantum foam are not obstacles in a photon's path; they're changes to the fabric of reality that the photons move through. If quantum foam doesn't exist, then two photons leaving point A can essentially travel the same, smooth path to point B. But if quantum foam does exist, and is causing constant changes in the fabric of reality, then the two photons would each effectively travel a slightly different path between those two points, Perlman said in an interview with Space.com. "Just like if you're trying to listen to sound that was made by loud speakers that are out of phase with one another, you get noise," Perlman said in an interview with Space.com. Giovanni Amelino-Camelia, a theoretical physicist at the Sapienza University of Rome, said in an email that work to put limits on quantum foam is "extremely important," and that Perlman and his colleagues are "a very strong group, for whose work I have high consideration." "Both quantum mechanics and general relativity have been enormously successful. They are two of the greatest successes that modern physics has had in the last century plus," Perlman said. "And yet for some reason that we don't understand, when you try to write gravity in the language of quantum mechanics, it's very difficult. Up until now it hasn't been done."